HERE IS NO SUCH THING as a perfect hymnbook or missal. Why would you try to make your own Missal/Hymnal for the Extraordinary Form when there’s the Campion Missal? The quest for the perfect hymnbook has been revived lately. This time I’m aiming to have it ready for Pentecost. I have thirty days. It started back in early 2011 when a certain priest outlined a project to make new improved Mass books. Our old books were getting on a bit and plagued with typos in the Latin. They had the order of Mass, a few devotionals peculiar to the parish, and a collection of hymns. The new books would be along similar lines, but include readings and extra music for sung Masses. They would be ready by June. 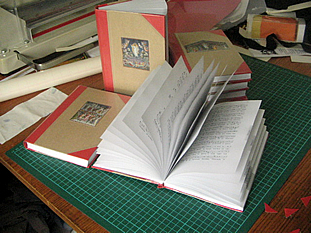 I had done Mass booklets before, and a couple of hymnbooks for pilgrimages, so had ideas about how to put it together. I use LaTeX, a document preparation system from the 80s. Infuriating as it can be, it can do a great job with cross references and indices and Gregorian chant. And it’s free. June 2011 came and went, so I hoped to get it done by Advent. By then I had a pretty good book together, but the cost of the print run was a major obstacle. One amazing advantage that the Vatican II and Campion Missals have is that they stick to Public Domain hymns. That really frees up what you can do with your book. You can sell it! Of course, you can sell books with copyright hymns too, but you need to negotiate licences and have set print runs and pay fairly considerable royalties to different people. Once I had negotiated licences for the handful of copyright hymns for parish use I was not keen to go back and ask for commercial licences. So, since I could not subsidise the printing with sales, I made about thirty copies of a nearly 300 page hymnbook myself over the Christmas holidays. Another experience I was not keen to repeat. Mistakes in guillotining cannot be undone. And your average home laser printer is not made for printing book. And guillotines are very sharp. In 2012 I was drawn into preparing sung Masses and time passed quickly. The Campion Missal came out. It was considered too expensive for our small parish community. And it didn’t have Help of Christians, Hail Queen of Heaven or Hail Redeemer. Now the PVA glue bindings are coming apart on the homemade books. New books are way overdue. Now my evenings are spent tweaking the book and setting up brandt.id.au to accept donations. Today I squeezed in Lead Kindly Light by Cardinal Newman. Despite all the hassles, working with these treasures is still a joy.